Ahh, the long awaited vacation! Whether that brings to mind time spent by the pool or extra time sleeping in – you can certainly count on great outdoor things to do in Ogunquit. Highlights will include actual time spent in clean Maine air – no concrete sidewalks – and adventures worth sharing on Instagram, Facebook or Pinterest. Ogunquit is a town that is truly a Maine destination. A Mid-September tradition – so you can think of it as truly a fall event. The festival is highlighted by outstanding crafts and old fashion New England fun. Set at spectaular Laudholm Farm and minutes from the hotel. Check out the 5 Best Things to Do at PunkinFiddle. Ahh, the colors, sights and sounds of autumn! When Fall is here, it brings one of our favorite festivals of the year: OgunquitFest. Lasting the entire month of October – so you can think of it as Oktoberfest – the festival is highlighted by a weekend of additional fun and activities. From Oompa bands to high heels. Check out the 5 Best Things to Do at OgunquitFest. There one weekend in October where you can sight see the OgunquitFest scarecrows and have an extra bonus festival right next door in York. While you can’t best those Marginal Way views, HarvestFest in Short Sands just minutes away. Check out the 5 Best Things to Do at HarvestFest. Nothing beats a classic Turkey dinner – except one when you don’t have to cook or clean! Whether you are a turkey fanatic or only hum-hum about a drum stick – the day is highlighted by friends and family around a shared table. Check out our 5 Best Ways to Enjoy Thanksgiving in Ogunquit. Ogunquit may be Southern Maine but it is still a destination for the great outdoors. And the Meadowmere Resort provides the perfect cozy accommodations for your Fall adventure. Just cause there is a nip in the autumn air doesn’t mean one should hibernate yet! Check out the Best Ways to Enjoy the Outdoors in Ogunquit. 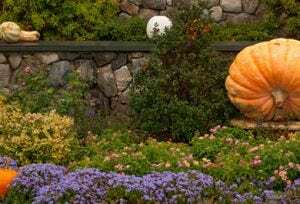 Still not sure about what to do for Fall in Ogunquit? Add a little outdoor fun with a hike at Mt. Agamenticus or a drive to the top to see the sights. Ogunquit from this view is absolutely charming. Be sure to bring your camera. There really is nothing as refreshing as the crisp Maine air to super charge you for the great Fall adventure. If you’re thinking of visiting our Ogunquit hotel for your vacation, to enjoy a cocktail in the pub by the fireplace or to head to Maine for fun, check out our Fall Packages and great hotel room choices with a central location.